Hellboy II: The Golden Army is a 2008 film directed by Guillermo del Toro. The film is a sequel to 2004’s Hellboy, also directed by Del Toro. Hellboy II: The Golden Army is written by Guillermo del Toro and Mike Mignola. Universal Pictures finances and distributes the film, which has a target release date for July 11, 2008. 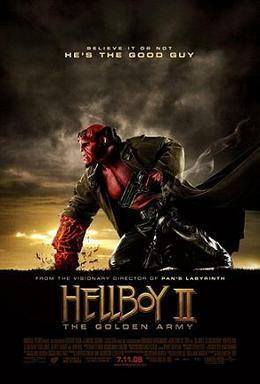 In August 2006, with Hellboy 2 being orphaned by the now-defunct Revolution Studios, the studio Universal Pictures acquired the project to be slotted for a summer 2008 release. Production was slated to begin in April 2007 in Budapest and London. del Toro, who had been in negotiations to film Halo, instead chose to stay with Hellboy 2 for “artistic and personal reasons.” In October 2006, del Toro shared his plan to recreate the classic versions of Frankenstein, Dracula and The Wolf Man.The director also reiterated plans for a third Hellboy to create a trilogy. With the success of del Toro’s Pan’s Labyrinth (2006), the director was able to fast-track production of the sequel to Hellboy.Guillermo del Toro began filming Hellboy 2 in June 2007 in Budapest and concluded in December 2007.The official trailer for Hellboy II was available from Thursday, December 20thNeil Gaiman spent several days on the set to get pointers on directing from del Toro for use in his own upcoming directorial debut, Death and Me. ~ by darkdestroyer on March 10, 2008.